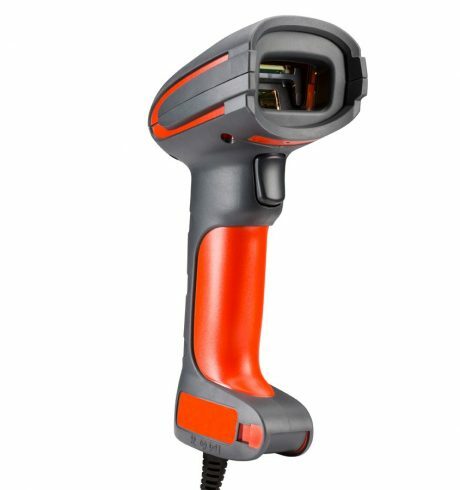 The corded industrial scanner Honeywell Granit 1280i is the specialist for great distances: it reliably reads 1D barcodes up to a distance of 16.5 m, even through packaging film. The large scanning distance saves workers a lot of time, particularly in warehouses. Forklift drivers thus sit comfortably and scan barcodes from highly placed, far off palettes, etc. Because it even shrugs off large temperature fluctuations, it is also ideally suited for usage in cold storage or in extreme heat (-30 to +50°C). As you are accustomed to in the Granit series, there is a laser engine inside its extremely robust housing. The 1280i therefore meets IP65 standards, protecting it against dust and liquids; additionally it withstands numerous drops from up to 2 m heights – within the entire temperature range. Its practical triple good scan confirmation improves user efficiency. No matter how loud, bright or dark the environment is – a good scan is clearly and immediately confirmed with vibration, a bright LED and adjustable beeper. Connect the 1280i via RS232 interface.